• No Plastic and No Added Sugar. 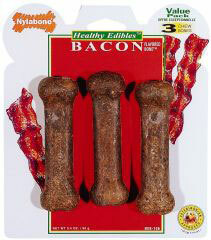 Beef by-products protein colloid casein natural bacon flavor natural flavor. Does not contain plastic. Does not contain any added sugar or added salt. Fully consumable and easily digested. High in protein and low in fat. 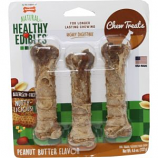 Three per package. 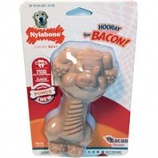 Nylabone - Healthy Edibles Bacon Bone - 3 per Pack product is categorised under Wholesale Nylabone Products, PA products, Wholesale Dog Products, Wholesale Food & Treats, Wholesale Treats.